KANSAS COUTURE: Fashion Show Tonight! As I mentioned the other day, I'm styling a run for a local fashion show. Considering how last-minute my participation was, everything is coming together wonderfully! 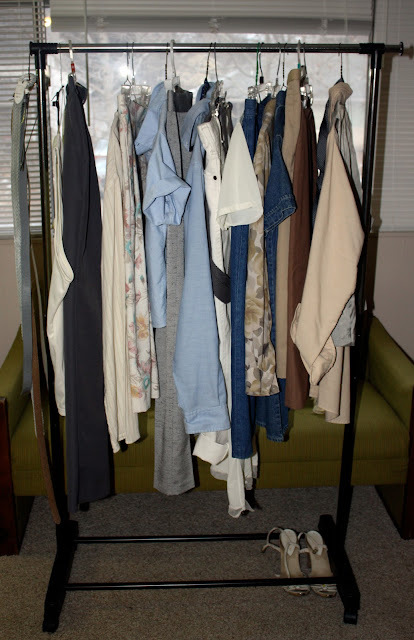 Borrowing clothes from the Social Service League, a local thrift store, I created a collection of casual spring looks. With a light color palette and generous doses of denim and floral, it has a breezy, carefree vibe. Local folks, you should come! It's tonight at Teller's at 8:00. It's a benefit for Haiti. Everyone else, stay tuned for pictures and hopefully video! Go get 'em, le tigre! All the best tonight! that rack looks like its going to be a great show! Git her done friend! Good luck! Oh, I am so EXCITED for pics of this! How fun for you!! How wonderful to create something like that! I'm sure it will be brilliant!! good luck! can't wait to see pictures! Neat, sounds like great fun! I'm guessing you had your pick of the store...Color me envious. A million goodluck wishes going your way right this moment. loving the colors and florals, can't wait to see the photos! wish I could go! Good luck! Can't wait to see the pics!